Cathy Leach is Professor of Trumpet and Associate Director of Undergraduate Studies at the University of Tennessee, where she teaches applied trumpet, directs the UT Trumpet Ensemble, and coaches small ensembles. She has received a 2004 School of Music Leadership Award, a 2006 Chancellors Award for Outstanding Teaching, a 2007 James R. and Nell W. Cunningham Outstanding Teaching Award, and Faculty Development Awards in 1995 and 2009. Currently Dr. Leach was a Sandra J. Powell Endowed Professor 2014-2016. Dr. Leach played principal trumpet with the Knoxville Symphony and Knoxville Symphony Chamber Orchestras for 31 years, and has been a member of the Toledo (OH) Symphony, the New Mexico Symphony, the Orchestra of Santa Fe, and the Orquesta sinfonica del Estado de Mexico. She is principal trumpet with the UT Faculty Brass Quintet, the very active faculty brass quintet at the University of Tennessee, and is a former member of Stiletto Brass Quintet, the New Mexico Brass Quintet, the Galliard Brass Ensemble and Monarch Brass, with whom she has toured and recorded. Ms. Leach appears on recordings on the Musical Heritage and Opus One labels. Dr. Leach’s students are performing professionally in orchestras and military bands, and teaching in universities and public schools all across the United States. 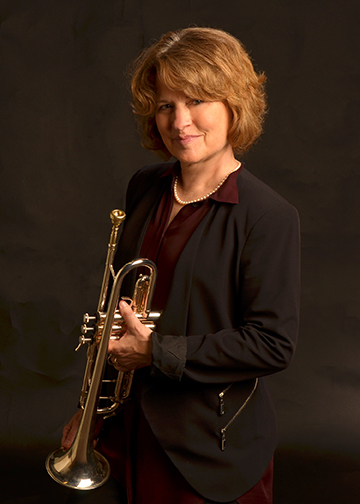 Dr. Leach is currently Vice-President/ President-Elect of the International Trumpet Guild, for whom she has often served as Board Member, committee chair, performing artist, and competitions judge. Under her direction the UT Trumpet Ensemble has performed at International Trumpet Guild Conferences in 1990, 1992, 1999, 2006, 2012, 2015 and 2017 often premiering pieces she has commissioned or arranged. In 2005 Dr. Leach founded the local chapter of ITG, the Smokey Mountain Trumpet Guild, to help promote communication among the outstanding trumpet players in the East Tennessee area. Dr. Leach’s major teachers include Clifford Lillya, Vincent Cichowicz, Walter Chesnut, James Darling, and Jeffrey Piper. Her trumpet ensemble arrangements are available through Elan Brass Press.